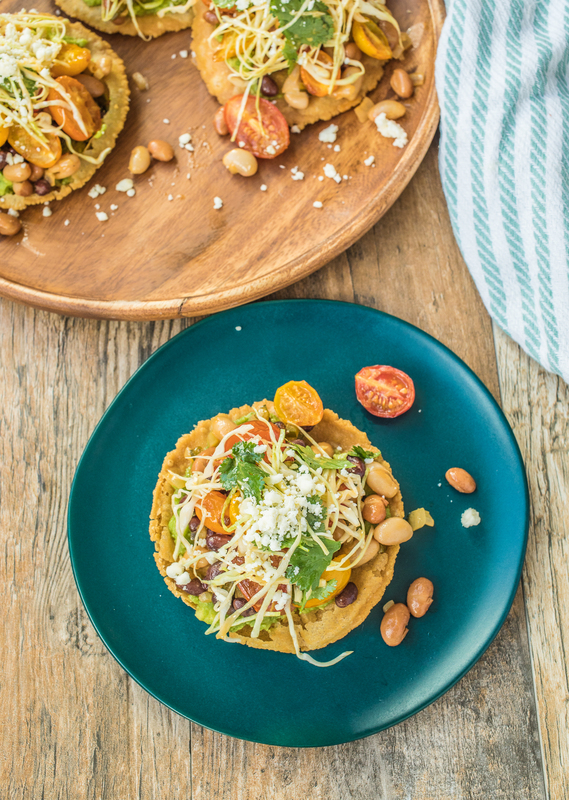 My mom used to make bean tostadas growing up, I don’t really remember at all how she made them, I just remember being really excited to eat them! If you live somewhere cold like I do and the tomatoes aren’t really great in the winter (or there just isn’t much local stuff to eat!) roasting them with a little lime juice and seasoning helps cook off some of the excess water and gives them nice flavor. Whisk together ginger, tamari, lime juice, brown sugar and oil. Toss halved tomatoes in marinade. Lay tomatoes halved side up on a sheet tray. Drizzle with remaining marinade and bake for 10 minutes at 325 degrees. Whisk together Dijon, honey, sriracha, lime juice and tamari. Set aside. Heat a saute pan over medium heat. Add a small splash of oil and saute onions and peppers until just tender. Add beans and season with salt. Heat beans through and drizzle with half the dressing. Toss to coat. Mix ingredients together in a bowl, until a soft ball forms. Let the dough rest 3-5 minutes. Place 2 tablespoons of dough into a ziplock bag and flatten using tortilla press, if you don’t have a press roll out a 1/16 inch thickness or 3 in diameter. Fry in 325 degree oil, until golden.